Early afternoon, while planning what to eat for dinner last night, I had a quick look in the freezer and spotted two lamb shanks I have from the lambs that we raised this year. How these were butchered I covered in an article here, It's time for the lambs. 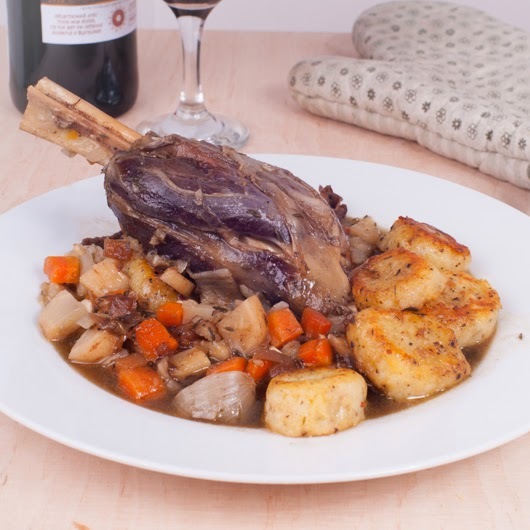 Lamb shanks are not expensive and due the work the lower leg muscles do and the amount of connective tissue, when cooked right they make the most amazing stew with masses of flavour with super soft gelatinous meat. This dish could be cooked in the oven in a heavy gauge pan, but this time I am doing this on the hob in a deep pan. The trick to making this a really special dish is what you put in the sauce. The flavour is going to come from the selection of vegetables. This time I finely chop onion and soften in some olive oil then add the lamb to the pot. Next, a few handfuls of diced vegetables are added. This time I have used carrots, celeriac and parsnips. A few porcini mushrooms, a bunch of dried thyme and a tablespoon of balsamic vinegar. Then enough water just to cover the meat is also added. Season with salt and pepper. The stew is then put on a very low simmer. I like to use a sheet of foil over the pan with the lid on top in order to make a very tight seal. The slower this is cooked the softer the meat will be. I then leave this simmering all afternoon until about an hour before we want to eat. The sauce is then separated from the meat and vegetables in order to thicken the sauce by boiling off much of the water. I do not do this with the meat in as it does not require further cooking. During the reduction process I add a little extra lamb stock to make the sauce even richer. While the sauce is slowly reducing I prepare some potato gnocci. Bake in the oven, in their skins, enough potato for the number of people you are feeding. For two people I bake about 500g of potatoes. As the potato is being roasted the quantity shrinks due to moisture loss, but this is desirable as the lower moisture content of the cooked potato is going to make much better, more intensely flavoured gnocchi. Once soft, remove the skins and press the potatoes through a potato ricer. Dust the riced potato in a little flour and season with salt and pepper. As the potato has been riced the flour and seasoning can me mixed through without working the potato. I would always use a ricer for this, other methods of mashing the potato will overwork it and the gnocchi will be rubbery. Once mixed, transfer the potato to a lightly floured surface gently press into a ball and then roll out into a sausage shape about 2 cm diameter. I then cut into disks and press a small indentation into once side with a finger. The gnocchi are gently transferred into boiling water, once they start to float I give them another 30 seconds and they are done. I strain the gnocchi and allow to stand for a couple of minutes while I melt some butter in a frying pan, then toss the gnocchi in the butter until they colour a little. I then served the lamb on top of all the stewed veg with the gnocchi on the side and the thickened gravy poured over the top. This is a super meal that costs very little and is really simple to prepare without taking much of your time. Its just a real shame that a lamb only has four shanks.